UNITED NATIONS CHARTER: BIAFRANS RIGHT TO FREEDOM IS YOUR LAW: ENACT WHAT YOU PREACH! The United Nations was historically formed on January 1, 1942, with representatives of 26 nations at war with the Axis powers who met in Washington to sign the Declaration of the United Nations endorsing the Atlantic Charter, pledging to use their full resources against the Axis and agreeing not to make a separate peace. At the Conference in Queben, Canada, in August 1943, the Secretary of State, Cordell Hull and British Foreign Secretary, Anthony Eden agreed to draft a declaration that included a call for “a general international organization, based on the principle of sovereign equality of all nations.” An agreed declaration was issued after a Foreign Minister’s Conference in Moscow in October 1943. Meanwhile Allied representatives founded a set of task-oriented organizations: the Food and Agricultural Organization (May 1943), the United Nations Relief and Rehabilitation Administration (November 1943), the United Nations Educational, Scientific, and Cultural Organization (April 1944), the International Monetary Fund and the World Bank (July 1944), and the International Civil Aviation Organization (November 1944). Representatives from the United States, Britain, the Soviet Union, and China met at Dumbarton Oaks in Washington DC, in August and September 1944 to draft the charter of a post war international organization based on the principle of collective security. They recommended a General Assembly of all member states and a Security Council consisting of the Big Four plus six members chosen by the Assembly. Voting procedures and the veto power of permanent members of the Security Council were finalized at the Yalta Conference in 1945 when Roosevelt and Stalin agreed that the veto would not prevent discussions by the Security Council. Roosevelt agreed to General Assembly membership for Ukraine and Byelorussia while reserving the right, which was never exercised, to seek two more votes for the United States. Read also:IPOB RIGHT TO SELF DETERMINATION, BRITISH-BUHARI'S DEFIANCE AGAINST 2007 UN RESOLUTION ON INDIGENOUS PEOPLE AND A ROAD TO A BLOODY AND FULL BLOWN WAR. Representatives of 50 nations met in San Francisco April - June 1945 to complete the Charter of the United Nations. In addition to the General Assembly of all member states and a Security Council of 5 permanent and 6 non-permanent members, the Charter provided for an 18-member Economic and Social Council, an International Court of Justice, a Trusteeship Council to oversee certain colonial territories, and a Secretariat under a Secretary General. The Roosevelt administration strove to avoid Woodrow Wilson’s mistakes in selling the League of Nations to the Senate. It sought bipartisan support and in September 1943 the Republican Party endorsed U.S. participation in a postwar international organization, after which both houses of Congress overwhelmingly endorsed participation. Roosevelt also sought to convince the public that an international organization was the best means to prevent future wars. The Senate approved the UN Charter on July 28, 1945, by a vote of 89 to 2. 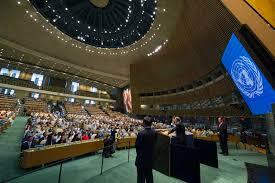 The United Nations came into existence on October 24, 1945, after 29 nations had ratified the Charter. Thus the United Nations (UN) is an intergovernmental organization aimed to promote international co-operation. It is a replacement for the ineffective League of Nations, the organization that could not maintain peace and order among nations. The United Nations Head Quarters is in Manhattan, New York City. Outside the U.N. building in New York, there is an inscription on the office wall saying, "They will beat their swords into plowshares and their spears into pruning hooks. Nation will not take up sword against nation, nor will they learn war anymore." A well versed Bible scholar would immediately know that the inscription was a quotation from the prophecy of Isaiah 2:4, which speaks of the much expected Messianic age when wars and conflicts will cease to be on this planet earth. Lots of people have wondered why the United Nations which is not a religious organization would borrow or quote from the Judeo-Christian book. The answer is not far fetched that the United Nations through its charter has assumed the arbiter for the world on all matters of right and wrong between nations, and we generally agreed to the assumption. But the big question has always been; in whose name and on whose authority does the United Nations act and make its pronouncements? Why has it chosen the Judeo-Christian book as a reference mark to the most needed world peace, yet it is not a religious organisation? What is the template that the United Nations have left for the world to emulate by quoting from a Judeo-Christian source? We can learn much from this attitude that any authentic message is worth the attention of any civilized person irrespective of the quarter it is coming from. It further throws more light on the fact that one has his liberty to embrace any religion of his choice without anybody interfering and provided it also promotes peace. Thus we see that the quotation from the book of Isaiah 2:4 was a complete promotion of peace in a time of war and conflict with the hope that war or conflict will no longer exist in the history of mankind. The United Nations in a bid to continue to maintain the world peace and orderliness, enacted charters on the rights of Indigenous People for self-determination in every society where people’s political and religious rights are infringed upon as commonly seen in Nigeria since its inception. Since the formation of the United Nations, there has been more new countries that emerged through this charter meant to end hostilities by host rude and brutal countries. Developed and civilized countries welcomed it and allowed the UN charter take its course. USSR, Yugoslavia, Czechoslovakia, Eritrea, South Sudan, etc. It is time for Nigeria to go the same way. Her sins have reached the peak and nothing will hinder her dying either naturally or violently. The choice is left for her to make. Its leaders can go on with their hatred and lies to incarcerate those who challenged their atrocities. It is just a matter of time before the final requiem of the mother-whore is announced. We eagerly await its demise as it approaches speedily.